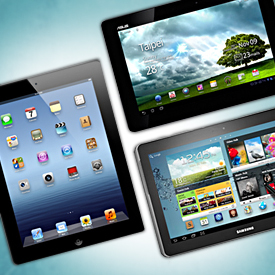 According to the market research firm Gartner, Worldwide tablet market has been estimated to sellout a total 118.9 million units in 2012, with the Mac makers dominating the sales and Android still trying to replicate its success in the Smartphone market. The global market sales forecast released on Tuesday clearly showed a 98% increase from 2011, in which 60 million tablets were sold. Based on the research of the firm, Android will not be taking much headway from the sales as the sales of the tablets based on Google’s OS will rise from a 17.3 million mark to 37.9 million, thereby increasing its market share by 3 percentage points to 32%. The principal analyst at Gartner, Roberta Cozza said that the Android’s market share will not be increasing from the mark made on 2011. Cozza mentioned that there were many reasons due to which the Android OS will not pose as much of a challenge to the competitor. According to Cozza, the hardware partners for Google haven’t done enough to make the ecosystem more interesting for the Android users. The two biggest vendors will be Samsung Electronics and the Amazon with its Kindle, which are expected to get a boost from an expected international rollout. Cozza mentioned the main issue as the lack of tablet dedicated tablets that therefore, take advantage of their capabilities. That’s due partly to the fact that the traction among fellow developers for tablet apps hasn’t been as great with Smartphones. The dominance of Apple however will fade eventually. Around 2016, tablets sales will have grown to about 369 million units and then Apple’s share would be 46% while Android will be just round the corner sticking to 37%. The upcoming dangerous competitor will be Microsoft and in a couple of years from now, it could pose a threat to both the company’s sales. With the launching of Windows 8 drawing closer, the hype is going up. The arrival of Windows 8 OS will allow Microsoft and its partners to compete on an equal level to that shared by Apple iPad and Android based tablets. Microsoft by the end of the year would have sold out 4.9 million tablets to mainly enterprise users which will provide Microsoft a 4.1% market share. Although the sales will grow, Microsoft is estimated to be the third-largest platform and that it will not surpass a 12% market share by 2016. Based on the assumptions that tablets running on Microsoft OS will still mainly be purchased by enterprise users, Microsoft will act as a wild card in the market. If the Windows phone could turn a few things, the Microsoft tablet sales might propel.